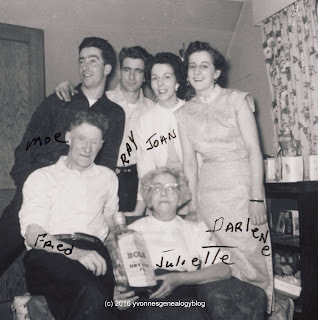 Aunt Darlene – Dad’s sister – died early this morning in hospital in Peterborough, Ontario, surrounded by her loved ones. She had been unwell for the last few years with multiple health issues, including COPD, diabetes, and dementia. Darlene was the youngest surviving child of Fred and Julie (Vanasse) Belair. Born “Marie Lilianne Darleen” on 18 October 1935, Darlene had three older siblings: Maurice (my father), Jeanne (Joan), and Raymond (Ray). Although born in Cochrane in northern Ontario, the Belair family lived in nearby Fauquier, where my grandparents relocated from southern Ontario during the Depression. Later, they moved to Timmins, where Darlene and her brother Ray went to elementary school. Later still, Darlene was educated at Académie Sainte-Marie in Haileybury, Ontario, a boarding and day school for girls run by an order of nuns. After she moved to Peterborough in the early 1960s, Darlene worked at various jobs, including managing a convenience store and owning and operating a taxi cab in the 1980s. She was also a factory worker at Western Clock Company (Westclox) and at Outboard Marine Corporation. I’m glad that I had a chance to see my Aunt a couple of years ago when my husband and our son visited my home province of Ontario. I was happy to be with Darlene once again, because I always felt that she and Dad were a lot alike – they resembled each other, were hard workers, loved animals, and both had a sense of humor and loved to laugh. Rest in peace, tante Darlene. Sad news but happy memories. RIP to your Aunt Darlene, who will be remembered fondly. She will indeed. Thank you, Marian.